Our attorneys have more than 30 years of cumulative experience. We emphasize a client-focused approach with every case. And "client-focused" is not an empty buzzword at our law firm. It's evident in the importance that we place on clear communication, from the initial consultation through the resolution of each case. It's evident in the effort we make to help our clients identify priorities and develop a strategy to achieve those objectives. It's evident in our aim to resolve each case as efficiently as possible in order to control costs, while remaining committed to producing the best possible outcome in every case. If a fair agreement cannot be reached amicably, we will advocate aggressively for you in court. Attorney Tanis B. Deitch is certified by the Supreme Court of New Jersey as a Matrimonial Law Attorney. Only lawyers who have a significant level of experience, education, knowledge and skill in a specific practice area can be certified. She helps her clients protect their rights during divorce and while resolving other family law issues, such as child custody and the division of marital property. 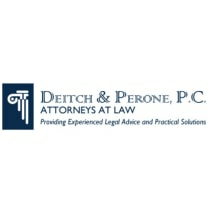 Ms. Deitch also assists clients in real estate, estate planning and probate matters. Attorney Joseph G. Perone also represents individuals in family law matters, as well as personal injury cases, workers' compensation claims and municipal court matters. He also advocates for individuals and businesses in cases involving commercial litigation and real estate law. Our lawyers work with clients throughout central New Jersey from offices in West Long Branch and Scotch Plains. We welcome the opportunity to review the facts of your case during a free consultation. We will answer your questions, provide a candid assessment of what you might expect and recommend the best steps to take.